Mike Baad fonder, CEO, President of Paragon films, Tulsa, OK. Hello Bryan Sorry for the delay to your response. I own A manufacturing company with multiple plants located around the US. So, I have been traveling and just got back to town recently to see the items. You have done an excellent job! I have a log cabin on lake Tenkiller, and i hung the pieces a few hours ago. I suspect you are indeed and artist! Billy Payne chairman of the Augusta national golf club also president & CEO of the 1996 Atlanta Olympic games , Georgia & Colorado. A very satisfied client who now owns an antique Empire chest of drawers. Bryan Stahl gave me the white glove service. He was pleasant, friendly, courteous, and prompt in arriving on time. Super careful with all details. He was not only on time but he wanted to deliver it right away! I loved that about him the furniture came wrapped up as he put it "as if it were explosives" if you are looking for quality fine furniture look no further. Bryan is the right choice for you. He is an expert at what he does and a true professional dedicated to his passion in fulfilling your furniture needs. You can always rely on him. It was an amazing experience A+++ LOVE IT!!!! Hi Bryan, We got our piano bench and it looks great with our piano. Its even nicer than we thought. Appreciate the thoughtful and careful packing couldn't break a carton of eggs as well as you wrapped it. Hope we can keep in touch. 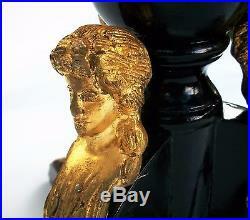 I have an old piano stool I might want to have restored Looks like your the man Thank you again Bryan for all your help. Hi Bryan It was so nice meeting you this morning. I would like to visit your show room sometime soon To see what other goodie's you have : Thanks again. I love its so much! It is gorgeous and exactly What I was looking for. Rob & Corinna D'costa, Illinois. Thank you for sending your Business cards & the note. The dresser looks great, it was a pleasure meeting you and your children. 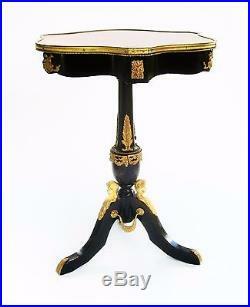 Gorgeous World Class French Empire Side Table. "Beyond perfect service" & "The chest is really, really great, a job well done". That's what this table exudes. I love the goddesses that sit high atop the legs. 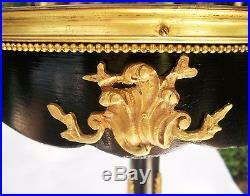 The swags between the table legs are spectacular, of course the leaves on the pedestal are regal. 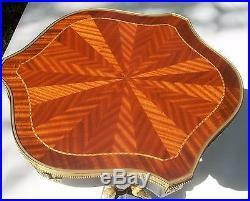 Some of the photos were taken with the top in direct sunlight, this showcases the "shimmering" effect on the inlaid top. The wood seems to come to life in direct sunlight, amazing & very beautiful. Every where you look beautifully showcased details, the table top design is excellent, matched by the wonderful inlaid top, notice the gallery style trim all around the top, solid cast bronze. 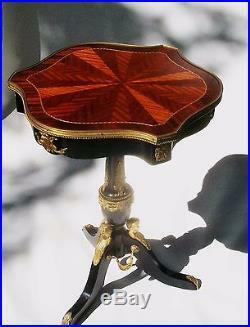 I restore fine antiques, this table required some world class attention & meticulous restoration. I restored this table to museum standards. 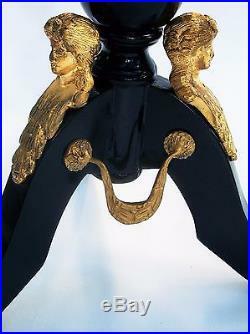 I regilt the 3 goddesses & touched up 2 of the swags(between the legs). 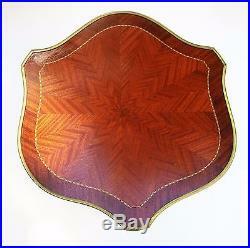 The inlaid parquetry top is stunning, it features outstanding grain pattern matches that give it a shimmering effect. I hand waxed the top, it looks rich! Intricate line/border inlay around entire top. 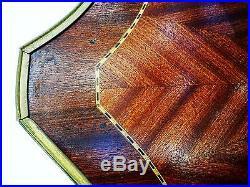 The parquetry inlaid top is Kingwood. 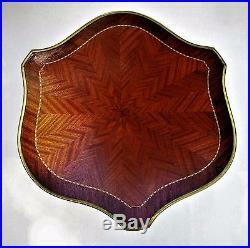 The serpentine side skirts of the top are mahogany veneers over solid mahogany. This table was entirely handmade, likely in France. 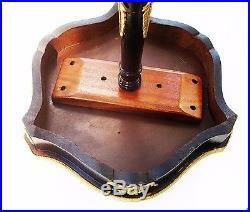 The solid mahogany pedestal support directly under the top I custom made to restore the table to pedestal. Then I fixed the pedestal to the support with a large dowel and mahogany wedge, the finest of sophisticated cabinet making techniques. A visual delight, you will love this fine piece. You can pick this up at my home studio by appointment. I will gladly load it in your vehicle for you. The benefits of custom crating.... 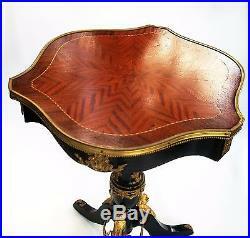 The item "1785 Parquetry Ebonized French Empire Directoire Antique Side Table Tea Table" is in sale since Wednesday, November 05, 2014. This item is in the category "Antiques\Furniture\Tables\1800-1899". 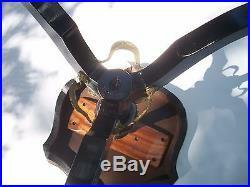 The seller is "bryanstahl" and is located in Fox River Grove, Illinois.